In its purest form, fake news is completely made up, manipulated to resemble credible journalism, and aims to attract maximum attention from “expert” opinions. 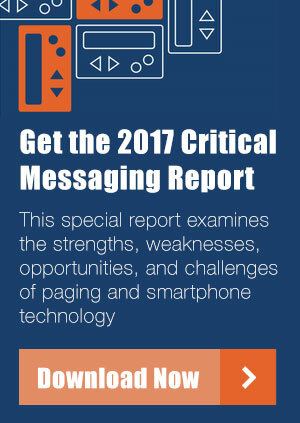 Jim Nelson, President of the Critical Messaging Association of America (CMA), gets frustrated by how fake news attempts to discredit the critical need for paging: “…that simply is not true. Paging systems and pagers continue to be put into service every month all over the world for healthcare personnel, first responders, and government employees.” The CMA represents 22 Paging companies and multiple critical messaging vendors in Canada and the United States together with individual members from hospitals. The CMA President is referring to a recent hospital survey of 200 hospitals in the U.S. to discover that, “90% of these organizations still use pagers. Now considering there are 5,627 registered hospitals in the US, if this percentage holds true, then 5064.3 of them use paging.” Numbers in Canada would proportionally reflect those south of the border. Igor Gluic agrees. He is the General Manager of Citipage Ltd. paging/critical messaging company in Alberta where their principal client is the Alberta Health Services [AHS]. The company manages about 10,000 paging devices in the Edmonton Zone of Alberta supported on a 24/7 basis. “Paging is being used for critical messaging along with cellphones for many reasons,” says Igor. “It is true many people are using mobile phones for non-critical messaging – until they miss an important message.” In fact, Apple, and Google both state in their developer’s agreement to NOT USE their service for emergency communications. 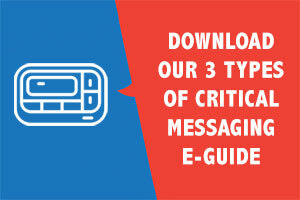 Igor and Jim suggest that smartphones are useful and convenient for general messaging and searching for information but not for critical messaging. Hospitals rely heavily on pagers to contact staff in these critical situations, since paging does not rely on a cellular network. It is scenarios like this, which are common in hospitals and health systems across the country, that illustrate why pagers remain so useful for critical communications. Despite the prevalence of pagers in hospitals around the country, there remains a lot of misconceptions about what pagers can do. Here are a few of these misconceptions. Fact: Paging still offers the latest, best and most reliable messaging technology for delivering critical information mobile work force directed by the hospital. Additionally, paging is a simulcast technology, meaning users have overlapping coverage from multiple paging transmitter sites, whereas the loss of a single cell tower typically means loss of service to the cell phone. Fake News: Pagers don’t work well with other devices. Fact: It’s accepted that smartphones have changed the communication game, especially in hospitals. But, we also know that cellphones lose coverage inside many buildings and even outside where signals are blocked by large structures. 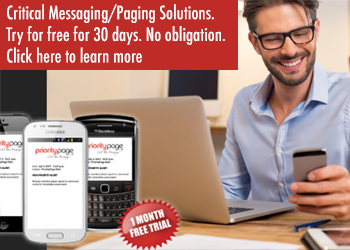 To coordinate communication with devices, the Paging industry developed the Messaging Manager which is like a switchboard that sends critical messages to individuals or groups via pagers, cell phones, smartphones, and email. Even as the use of smartphones and tablets grows, not everyone should have a smartphone to do their job. 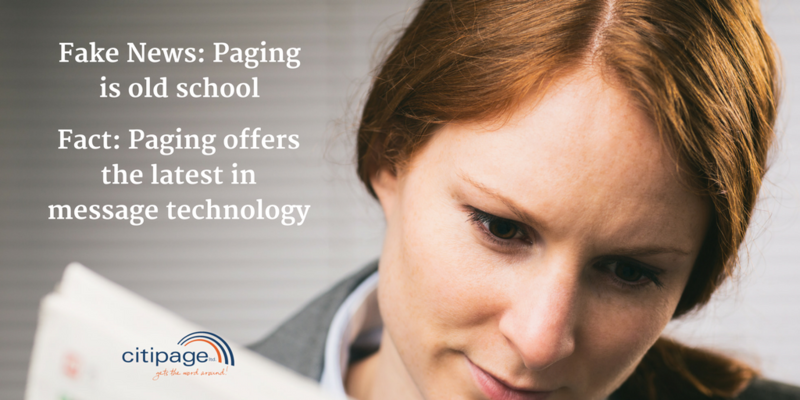 While emergency personnel are fans of their pagers, paging is also an affordable option that often makes sense for housekeeping, transport, and other staff who may not need access to clinical applications. In fact, it’s even desirable to keep a pager number and have pages simultaneously delivered to a smartphone. 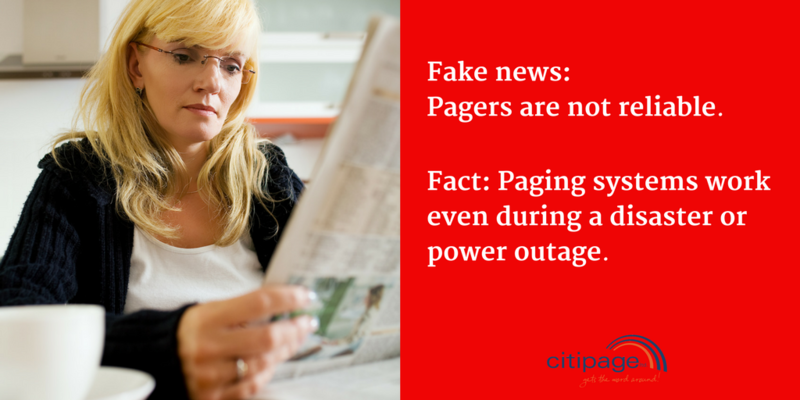 Fake News: Pagers are not reliable. Fact: Paging systems can run longer on backup power, so they work even during a disaster or power outage when it might be hard to find a working outlet to charge a cellphone. Paging transmitters communicate using satellite connections, keeping the transmitters immune from wireline network failures. When a mobile phone breaks, users lose all communications. They cannot easily be substituted by another phone and it would need all the apps to be re-installed on it. 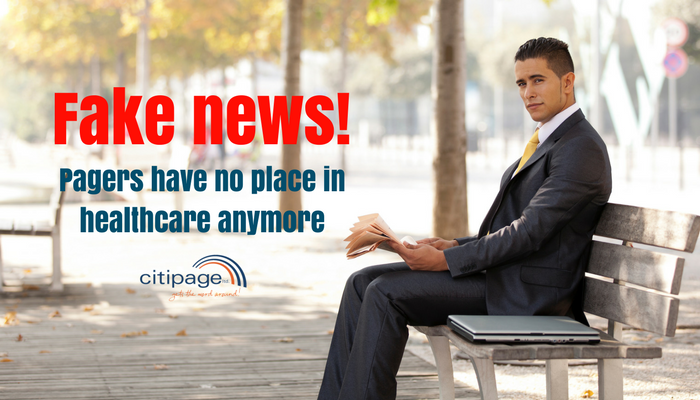 Fake News: Pagers have no place in healthcare anymore. Fact: Physicians, nurses, and other hospital staff rely heavily on pagers, and for good reason – reliability and better reception signal in hospitals is still unmatched by smartphones. Yet, many administrators have no incentive to use pagers until their clinicians have an unfortunate incident caused by service outages, system failures or cell phone bad reception. These are almost inevitable during severe weather or cell-site outages. Most hospitals find that a diverse device mix is key to providing reliable communication across a variety of roles and workflows. When we look at pagers and smartphones, it’s not one or the other. With both devices and networks in play, clinicians and staff are connected and feel prepared to handle any emergency effectively. Paging isn’t going away anytime soon. Doctors, nurses, 911 first responders, firefighters, police, energy distribution systems, and industrial alarm teams are sure to agree. Fake News: Paging networks don’t have nationwide signal coverage. Fact: Citipage released a Paging App for smartphones 7 years ago (iPhone and Android devices) for the health care industry. The paging app is used mostly by physicians which is added to their regular pagers. [The physicians use regular pagers in the hospital and the paging app for wide are coverage]. With the “Pager in an App” developed by Citipage now gives users nation-wide paging coverage. Are You Tracking Your Hospital Mobile Devices? It’s a disaster! Does your cell phone work?